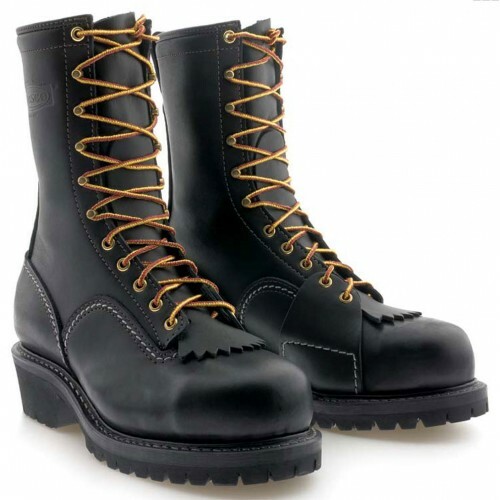 Wesco's 10" Groundout boots in black are here to provide you with ample support, comfort, and protection in your working life. Designed for electrical work, these boots combine support in the sole with protection in the leather to prevent any unfortunate accidents that may come your way when on the job. These semi-lace-to-toe boots are made of 7oz full-grain leather, which will put a nice buffer between you and the hazards you face, whether they be at work or out and about in your daily life. At the top of the boot, you have a rolled-leather facing which creates a trendy look. Who says boots can't look good while being functional? Brass hardware adorns these lace-up boots to give you a working, yet fashionable look. A full-leather gusset and counter pocket also show up on these beauties. A permanantly-formed Stytherm counter sits on these boots as well to aid in stability. The build of these boots is specifically for your comfort. Double full-leather insoles cushion your feet whether you are walking or climbing, and PORON performance shock absorbers take the load of every step off your feet. Ever get pain in your work boots because they weren't built for comfort? These boots are the answer to your dreams. They have a non-corrosive, slightly arched steel shank, which bends to the curve in your feet, reducing that annoying pain you get in your arch at the end of a long work day. These boots also come with a puncture-resistant sole held in place by all-leather welt construction; so no more worrying about nails getting through your boots or shards of glass sending you to the emergency room. A composite toe adorns the end of these boots to protect your toes from falling debris and other hazards. Finally, a 109 Vibram lug sole gives you the traction you need on the job site. Looking for brown rather than black? Head over and check out our Brown Leather Groundout boots. Wesco's Groundout is your go-to boot for safety and comfort. Meeting the AS F2413-05 MI/75 C75 EH PR and CAN/CSA Z195-09 standards, these electrical-resistant boots are a must-have for your everyday worker: resistant to electricity and resistant to damage.